LIN'S GENEALOGY HELPS: My book is published! 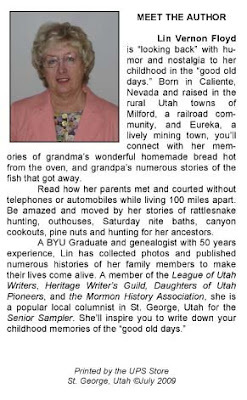 This book is a collection of my column articles published in St. George, Utah’s “Senior Sampler.” It's entitled LOOK-ING BACK...At the “Good Old Days.” Being a retired educator and an empty nester, I have more free time now for pursuing my lifelong passion for genealogy through publishing my ancestor’s stories and writing articles for columns, blogs, and magazines based on my life’s experiences in a family. Finding a passion or interest you enjoy can add richness and interest to your days at any age, whether you are able to make it into a livelihood or just a leisure activity. Spare time to pursue hobbies or talents was a rare commodity for our parents and grandparents as they used all their time just to put food on the table and take care of their family. Recreational activities were few and far between for them. Holidays and family celebrations were opportunities to gather and enjoy each other’s company. They would have loved to have had more breaks from every day work activities to pursue their individual talents, and hobbies. Hopefully I have cap-tured some of the experiences from their lives that show the passion and legacy they left for their descendents. We all have grandparents and parents who loved, nurtured and molded us as we grew up under their influence. May my stories bring to mind your recollections of your earlier days and perhaps light a fire under you to write down some of your experiences so they won’t be lost to your descendents. Self published, 80 pages with photos, bound paperback and available for purchase NOW for $10 plus postage ($2 in USA). Just email me: lin at sunrivertoday dot com for my mailing address so you can send payment for your purchase. Thanks for your support. All money earned goes to my youngest son's college fund. kavita.saharia@gmail.com....hope shipping charges are not very high. How very wonderful that you have published a book! You are an inspiration to me to start "jotting down" memories for the future. Congratulations again and I look forward to reading your book!! Congratulations, Lin! Another Ta Dah for you! You always inspire me with your ability to focus and just get it done! You know that old saying how some people are good at getting things done, some watch it getting done, and others wonder what just happened... you are definitely one who gets things done. Admiration and accolates all round! Congratulations, you must have wonderful feelings of accomplishment (product) and enjoyment (process) both! Yae, Lin! Congratulations! It must feel so good to have it done and printed. You're an inspiration to us all. Good job on the bio!! Wow! This is awesome! I dream of a time when I could spend more time writing and maybe even publishing! Way to take advantage of the moment and pursuing your genealogy! I love it! Awesome!